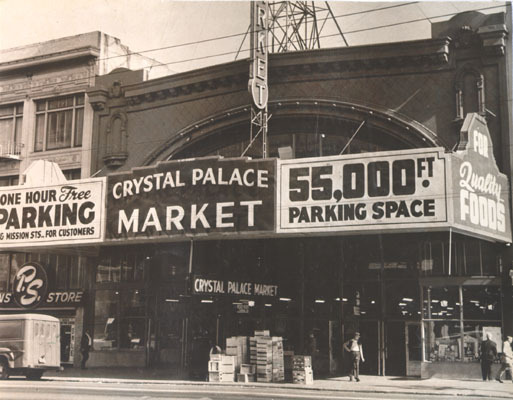 Crystal Palace, a classic large center-city market, formerly at 8th and Market Streets, in a site that once housed a baseball stadium, and now is being extended vertically by a massive apartment complex being built by Angelo Sangiacomo's real estate empire. 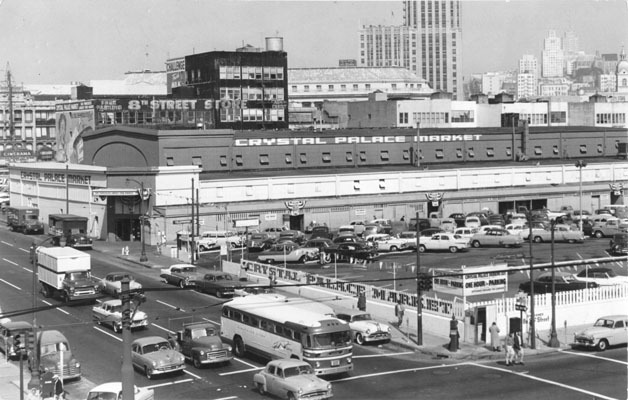 Crystal Palace Market and intersection of 8th and Market Streets, c. 1950. 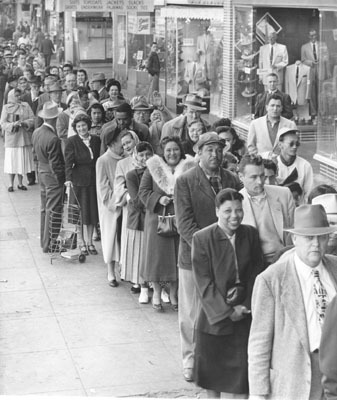 Waiting to buy New Zealand beef, 1953. Thus author Gus Lee describes the Crystal Palace Market of his youth in China Boy. His description is no exaggeration. During its 36-year run, the 71,000-square-foot market imported goods from at least 37 countries to provide the most varied offerings in the country. 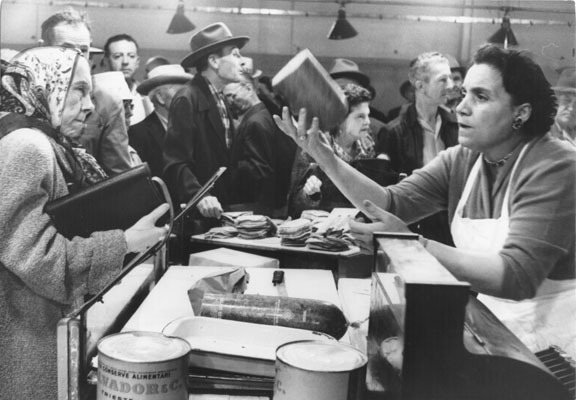 Its 65 shops included four dairy stands – selling 36,000 eggs daily – four poultry stands, six butcher shops, three fish markets, and seven fruit and vegetable stands. 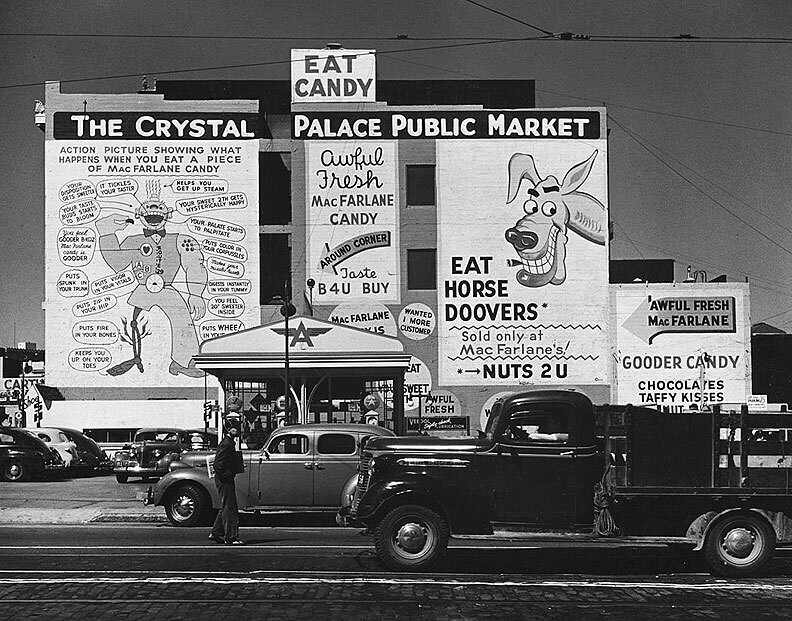 It featured a pet shop, a five and dime, two tobacco shops, and a phonograph record store. One stand sold only golden honey. When banks eliminated Saturday hours in 1953, the Crystal Palace Market promptly opened a check cashing service to meet its customers’ needs. 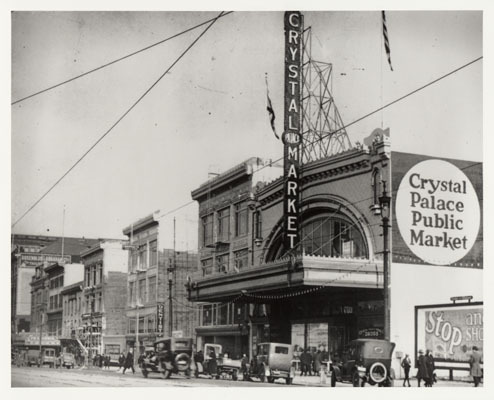 When the Crystal Palace Market opened at Market and Eighth in 1923, the site was regarded as “out of town,” and raffles of automobiles were held to draw customers to the huge structure. Named for the historic Crystal Palace in London’s Hyde Park, the steel-framed, skylight-lit bazaar was a gamble that its huge central market could replace the corner grocery story. 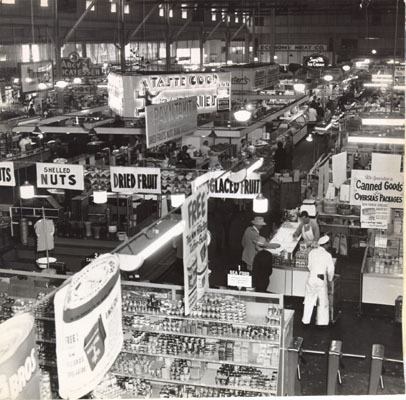 The market’s owners operated the grocery section, two liquor departments, two tobacco and magazine stands, and the appliance store, but the other 64 concessions were leased to individuals and firms. Three hundred people worked there. 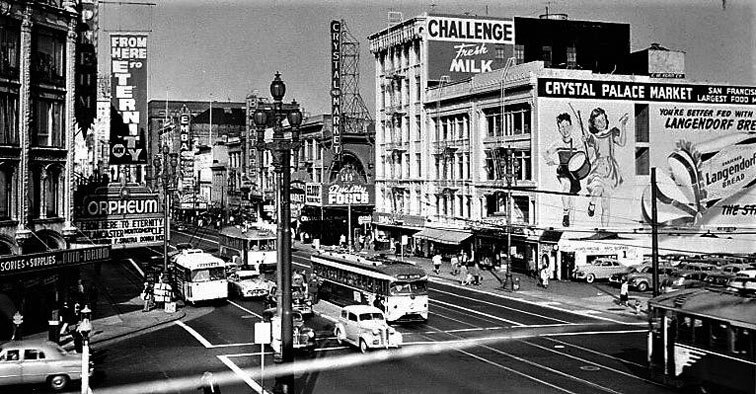 The Market featured twenty-two entrances on five different streets: Market, Mission, 8th, Stevenson, and Jessie. Free parking was available in its 55,375-square-foot lot, or for 5¢ shoppers could arrive via the Municipal Railway’s Shoppers Special shuttle that traveled down Market from 2nd Street. Customers came from all walks of life – Queen Mother Nazli of Egypt came to shop there every day when she lived at the Fairmont Hotel – and drove to the Palace Market from as far away as Santa Rosa, Sacramento, and Merced. The Palace advertised “almost a country fair feeling in the air,” with clerks hawking their wares at the top of their voices to compete with strolling minstrels, an organ grinder and his monkey, and bands playing on the balcony. A gypsy fortune teller featured a parakeet who would pluck your fortune from her stack of cards. The Horseradish Man, red-eyed and weeping from grating his product, attracted wide-eyed children to his stand. Children also flocked to the peanut butter man for his free samples. Soap salesman Fred Wiedeman, stationed near the Market Street entrance, gathered crowds by letting his snakes crawl all over him, then demonstrated his wares to wash himself clean. Some Palace patrons recalled bootleggers at the back door and crap games with homemade beer in the basement. The four-acre lot at Market and Eighth had hosted crowds well before the Crystal Palace Market was built there. From 1874 to 1881, it was the site of the Mechanics Institute Pavilion where annual mechanics’ and manufacturers’ fairs were held. After that pavilion was demolished in 1881, the California Baseball League got its start at Central Park built on the lot. Shortly before the turn of the century, when the league outgrew the site, the park was replaced by the Central Theater, featuring touring shows and melodramas. It was destroyed in 1906, and for the next 16 years the empty “Circus Lot” hosted Ringling Brothers, Barnum & Bailey, and all the other big circuses and carnivals, plus a balloon ascension attraction. In 1922, brothers Oliver and Arthur Rosseau bought the four-acre site and started their fabulous bazaar. Emporium-Capwell purchased it and the adjoining property in 1925; then in 1944 it was bought by 33-year-old Joseph Long of Alameda, who in the previous seven years had started a chain of drug stores. He “modernized” the huge market by breaking up its open spaces and building a large drugstore in one corner. But postwar tastes changed as families moved out to the suburbs. On August 1, 1959, the Crystal Palace Market closed its doors and was demolished to make room for the new $8 million, 400-room Del Webb TowneHouse luxury motel.